From San Francisco, USA to Dunsfold, England in 53 days via, most importantly, St. John's, Newfoundland and Clifden, Ireland. OUR MISSION is to recreate the flight and bring to life the impact this famous flight had on the peoples on both sides of the Atlantic. This and subsequent Vimy flights demonstrated that the 'aeroplane', considered a tool of war, also had a tremendous civilian commercial application. Alcock and Brown's flight happened when a spirit for adventure and incredible skill combined to accomplish a truly heroic act. Today, significant pioneering and invention often happens at the far reaches of science and at the molecular level; invention appears out of reach today. 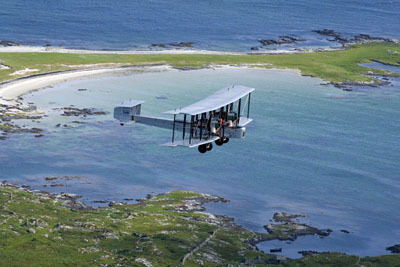 The Vickers Vimy replica that will fly across the Atlantic has become almost as famous as its original ancestors, whose feats also include the first London to Australia flight in 1919 and the first London to Cape Town flight in 1920 - our beloved Vimy has flown over 30,000 miles and across 30 countries. Come fly with us – through the past, the present and into the future! 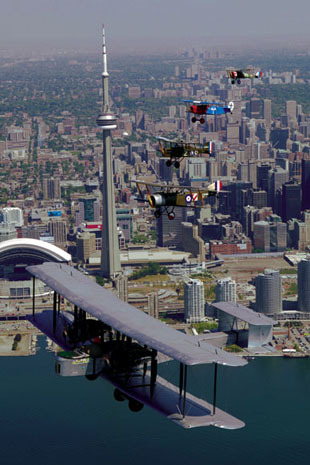 The Vimy and four airplanes from Brampton's Great War Flying Museum on June 1, 2005, flying over Toronto, Canada on its way to Ottawa, Canada.